Lush forest surrounds this hillside cabin. Shimmering stars shine over the bubbling hot tub. Make your trip complete - toast marshmallows over the fire pit. Smoky mountain thrills are minutes away. Emerge from the canopy of trees to Laurel Branch Cabin and relax in complete privacy at this beautiful, custom-built home, where the interior is as stunning as the exterior. Spend your days lounging on the shady, expansive deck, and enjoy evenings of grilling out and relaxing. Finish your night with a long soak in the large hot tub while you take in forest views. The first-floor master suite features a king-sized bed, TV with satellite and DVD player, and a bathroom with a large, soaking tub and separate shower, as well as radiant heat in the tile floor for cool mornings. The second bedroom, located upstairs, has a queen bed, located next to a full bath with a tub and shower. Upstairs also includes a loft with a foosball table and queen-sized futon. 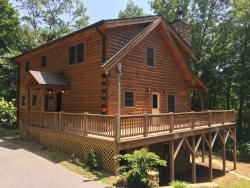 Laurel Branch Cabin is perfectly located for outdoor enthusiasts, with convenient access to the Nantahala River, Tsali Mountain Bike Trails, Fontana Lake, and the Needmore Preserve. The Tuckaseegee River is less than a mile hike from Laurel Branch. They made it very easy and were very polite. It was a nice stay. It is up off the road by itself which is nice when you're "getting away". There is a beautiful river on the way in to the cabin. And its close to plenty of attractions. What a beautiful getaway. My Boyfriend booked this on a last minute idea for a weekend trip to the mountains. What an awesome find. We brought the bike and went to NOC and the Trail of the Dragon and got back in time to relax in the hot around the fire. Thank you for sharing! IT was a perfect relaxing weekend. We had a really enjoyable time at this wonderful cabin. We were in the hot tub every night. The cabin and the scenery was amazing. We really love this cabin. We did not want to leave. What an awesome house. I was just amazed. The warmth that this cabin has expressed and provided, you can tell that it was built with love. You can see the craftsmanship it displays. This was our 35th wedding anniversary. The setting was perfect, so quiet and peaceful. I love this place and can't wait to return. We enjoyed celebrating our 50th wedding anniversary here. My wife calls this cabin "A Smokey Mountain Tree house". This was a beautiful part of the country. This cabin was adorable. Beautiful part of our great country. The cabin is adorable. Private and quiet. We joined our friends and had a great time. We enjoyed every minute of our stay. Relaxed, refreshed, we left feeling like "We came home" Thank you. We enjoyed every minute of our stay. Relaxed, Refreshed, we left felling like we came home. Thank you. My family and I had a wonderful Thanksgiving celebration here and riding the Polar Express. It was so relaxing and quiet. We enjoyed staying here and spending much needed quality time. As me and my friends walked thru the door the cabin is stunning! This is my first time ever to a cabin and I didn't expect such a beautiful cabin and scenery! Thanks for letting us rent out this cabin! Best mountain vacation! Desperately needed it! As me and my friends walked thru the door of the cabin, it is stunning. This is my first time ever to a cabin and I didn't expect such a beautiful cabin and scenery . Thanks for letting us rent out this cabin. My husband and I really enjoyed our vacation here. We couldn't have asked for a better place to honeymoon. We went horseback riding, white water rafting, and hiking. We drove to Gatlinburg, TN. It was such a beautiful drive. We loved just spending time at the cabin making S'mores and playing with our black lab. It was hard to get him to leave. It was our favorite trip and we will be back for sure. Very nice cabin, we enjoyed our stay - so beautiful. Cabins has some great features. Enjoyed Bryson City and Coopers Creek Trout Farm. Had a very nice dinner of fresh trout. We will be back.